Hello Games' ever-evolving universe-spanning adventure gets full multiplayer support, a visual overhaul, major base-building upgrades, and more. 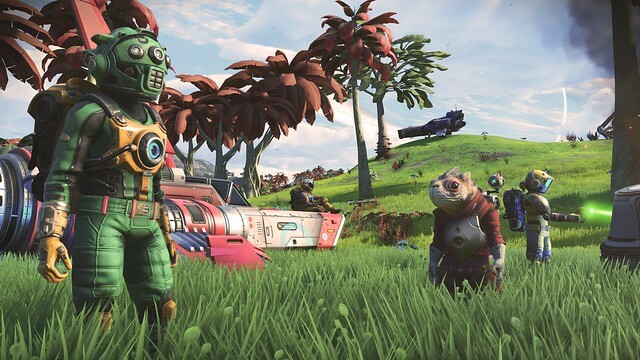 On July 24th No Man’s Sky Next will launch as a free update for everyone who owns the game. On behalf of myself, and the team at Hello Games I just want to say – Thank you. 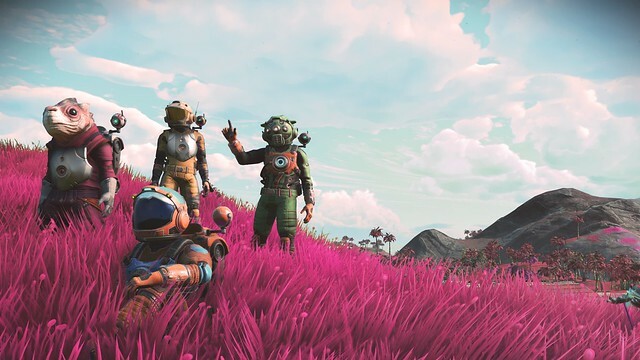 We are so excited to have made Next, and to continue to improve and develop No Man’s Sky, because of you, the community who play, explore and share this universe with us. It means so much to us. We are focused on development, but we know people are hungry for details so wanted to share this before launch. 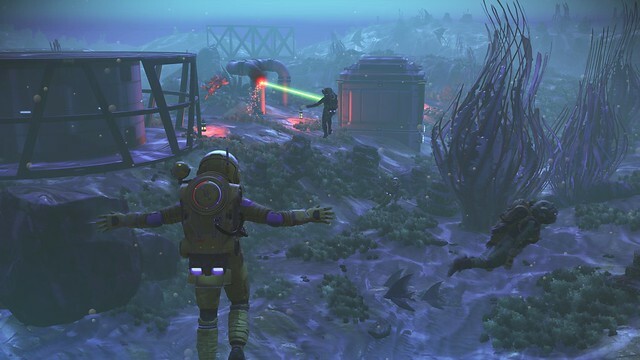 When No Man’s Sky launched it was broad in a way that almost no other game is, but with four updates it has become broader and so much deeper too. Now the release of Next brings a full multiplayer experience which makes the universe even more rich. We can’t wait for you to play, but hopefully you can see from the trailer this is a very new experience. Team up a small team of friends and explore the universe together, or be joined by random travellers. Nearly two years ago our small team of friends, with a shared love sci-fi, opened up the universe of No Man’s Sky for the first time. It was an innovative, weird and at times lonely game. I loved that, it reminded me of the science fiction books I grew up with. 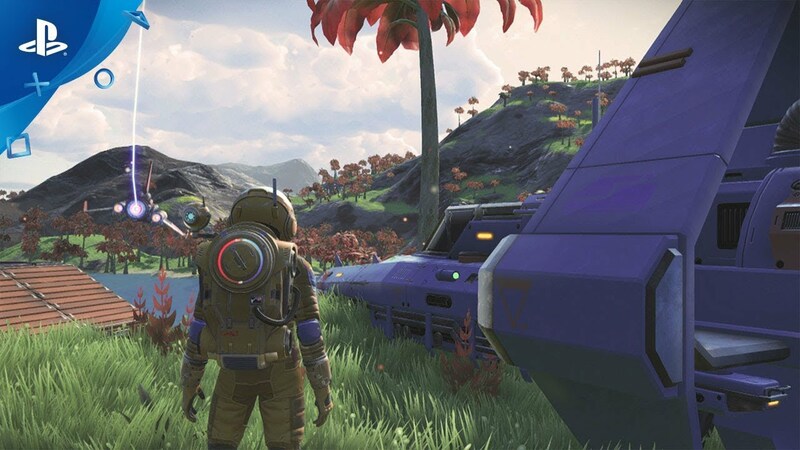 This is an incredibly important update for us, but it’s also just another step in a longer journey, and we’ll continue to support No Man’s Sky in this way for the foreseeable future. It took 2 years but the game is finally what it should have been day one. And look at those graphics it’s not nearly as ugly as it once was, and finally 3rd person play thank god. I would re-download this if I could play in VR. I would die if this had VR. I would pay for a VR DLC. Otherwise I don’t know if I’ll be able to get back into it. Is PS+ going to be required for the multiplayer stuff? Unless it’s a Free-2-Play game yes you will need PS+ to access the multiplayer portion of the game. Nope. It’s free to play online. Confirmed already. got a source for that? Are you sure you didn’t just misinterpret them saying the update itself was free? The back of the No Man’s Sky Xbox One box art did not say multiplayer require Xbox Live Gold so it probably wont require PS Plus as well for multiplayer so thats great! I just tried to down load and I need to be a plus member .I have no interest for multiplayer so will I be able to play Next stand alone?? It’s unfair to say this is what the game should have been day 1. I’m glad they continued to plug away at it, and it was a very ambitious game, initially that couldn’t deliver on the wonder. After all these updates, there seems to definitely be some fun to be had. I’ll jump in again. Please bring it to PSVR! Are there any new trophies included in this update? I need to play this in VR. That’s the only way to get me back in. Then please stay out. Not every game needs VR. True, not every game needs VR…But this is definitely a game that would benefit from it. Anything with interesting bright visuals looks great in VR. We don’t have many open worlds to explore (let alone galaxies) on the PSVR platform. Something aside from Skyrim would be nice. Doesn’t hurt you if other players are in VR, since you can still play without it. Lol callnmrmojorisin spoken like a person who never played VR. There isn’t a game VR won’t improve, so you might wanna try it before you comment on it’s usefulness. Sean made NMS Great Again! Thanks all team! Haha! I can’t wait to try this out! Jot me down as another VR hopeful, though. I’d even pay extra for that privilege if I had to! more than i expected keep the god work i loved from the day 1 i have it on pc and ps4. HYPE OVERLOAD. I REPEAT. HYPE OVERLOAD. I’m so thrilled beyond belief! THANK YOU HELLO!! I’m a pre-order fan still playing, can’t wait! Well done again, Hello Games. Omg omg omg third person view! Yessss finally!!! I am wondering if coop will include couch coop or just online multiplayer? Would love to play on the same screen with my boyfriend and now that it can be in third person I don’t see why that shouldn’t be possible. I’m so so excited! Can’t wait to jump back into the game! If they haven’t overhauled NPCs and brought those to life, I’m still not interested in coming back. I don’t care about MP… Make SP more engaging and I’ll be happy. Holy crap!!! time to dust of my copy…. I’m in awe of this update. It’s like a whole new game (again). Just wanted to say thank you for the continued work on this. I’ve loved it since the beginning, but i keep finding reasons to love it even more. I enjoyed NMS for what it was at launch, but continue to be amazed with each new update, and this one is clearly the most substantial yet. Thank you Sean and team for continuing to expand the universe that is No Man’s Sky! Much love from the No Man’s Sky community! Sean and Hello Games have been putting out free updates for the last two years and NEXT looks to be the biggest and best of them all! Can’t wait to squad up and head out into the universe with friends! Sean, it’s been a long time! Since stepping down as mod, I’ve continued to play NMS. I’m absolutely ecstatic that you’re still supporting the game. Thanks a ton, you’ve made a life-long fan. Well done Sean and all the team at Hello Games, I’ve been playing No Mans Sky since launch and watched it grow and mature. The commitment to your vision for NMS is nothing short of spectacular, I can hardly wait for NEXT week. I noticed xbox gets a exclusive suit and weapon for there pre order will ps get any exclusive suits or weapons as well? Yeah, we got early beta access for 2 years at the low, low price of $60. I agree that PS needs some sort of exclusive content for all the trouble at launch. incoming what it should have been day one comments. Looks really nice, but I hope multiplayer is optional. I like the lonely explorer feeling the game has had up to this point. Hello Games never ceases to amaze me with their continuing dedication to their customers and players. I’m definitely reacquainting myself with NMS in anticipation of this update. Thank you, Sean, for not throwing in the towel when the hate came pouring in. I’ve always believed in No Man’s Sky and I can’t wait to check out all the work you and your team have been up to. Did you add an ending this time? PS4 Pro optimized? I haven’t read anywhere it says it. I would hope that the visual updates include 4k. Stopped in to see if this update would include PSVR. Does not, but happy to see the other new things. I’ve enjoyed No Man’s Sky from day one. I quickly poured 100+ hours into it. More than just about any other PS4 game. And each new patch is like FREE DLC to me. Props to Hello Games for doing this! and.. PSVR support would be truly amazing! this update looks absolutely insane. glad i purchased it day 1 and glad the devs are still supporting it. i personally haven’t played it in forever. to whoever asking, no man’s sky already supports 4k. i did redownload when i heard it was getting a graphic bump. it appears that HDR is implemented in the shots above. I’ve been in love with No Man’s Sky since before day one and it just keeps getting better! Thanks for your commitment and ridiculously hard work! This is the only game I’ve been able to play flat since I got PSVR over a year ago. You guys are pulling me back to flat for a bit more haha! One of my top five games ever made! I’d feel lucky to pay for a psvr update with whatever downgrades are necessary if at all possible. Thanks again for this amazing universe we have to explore! They can add it in a future free update, put it as a separate mode so it wont be downgraded. I love the free updates they are doing! I love this game it keeps getting better with each update! PSVR and i am in!!! Add VR and I’ll buy it. Sweet, keep up the good work and thank you. I bought the game yesterday when the trailer was revealed. I can’t hate on the game anymore. I’m going to give it a try. I doubt it’s here, cause Hello Games would have mentioned it, but I’ll ask anyways. Any news for a splitscreen option? These sorts of games (Minecraft, Ark, 7 Days to Die) are always more fun with splitscreen [even if the players are limited by some sort of tether or whatever]. This game would be great to play with my younger brother, as long as I was with him as opposed to playing for him. That being said, whilst I expect it not to be there at launch, it would be awesome if this considered for a future update in a few months. I’m really excited for NEXT, and curious to see the changes your studio has dedicated over these nearly past 2 years post launch. Congrats on never giving up guys, despite the criticism. It would have been to easy to shrug it off, but you worked through it to bring the promise of this title to reality…Even if it took longer than you’d had in mind. That would be cool if they can add that! What time will NEXT update be available to download on the 24th? I live in the EST time zone. THANKS! Since when do you pay for updates? With all the changes and additions they have made, they could have easily gotten away with selling this as a new “enhanced version” of the game. It’s pretty good of them to be giving all of this away for free to people who already got the game. Though, of course, some people will feel entitled to the new content, I’m sure. I’m thrilled with the updates. The only thing I was wishing for that’s missing is the psvr support, but I still hope that’s a surprise reserved for the launch day. If not let’s hope for it in the “next” update. Hi all. Any idea what time the NEXT update will go live on psn???? I have desperately been trying to find this out! Was hoping to know so I could work a half day before it releases if it’s only available after midday. As things stand I’ve taken the whole day off, playing it safe! Now if Sony/PlayStation would allow cross platform play this type of game would be truly incredible. You can argue “too late” all you want, but “too little”?? You gotta be kidding! Come on Sony, the only thing missing is this game free on the Plus.